It’s the Sunday night after Thanksgiving. It’s so quiet in my Brooklyn apartment that it feels like I’m either in some country house I’ve rented for the weekend or it’s New York City in January after a blanketing of snow quiets the city. Never mind, a neighbor just started blaring some Katy Perry remix and all is normal again. For the first time, I hosted my family for the holiday and was really honored to do so. It’s been a full house here for days. My family is almost always together for this holiday, which includes celebrating my older sister’s birthday, but we are usually in Vermont. It’s hard to beat my father and stepmother’s house, the fireplace, the snow (sometimes), the sauna, the woods, it’s pretty perfect for the occasion. But for various reasons we decided to do Brooklyn this year and my boyfriend John so graciously hosted us in his slightly bigger apartment than mine up the street. This is such a sullied American holiday—one that’s nearly impossible not to celebrate here in the U.S. and yet one that never feels right celebrating either (what with the whole genocide of native peoples and all, not to mention a holiday founded on the slaughter of animals)—so it’s complicated really. I do love to gather my siblings and half the parents together and have days to sit around catching up on our years and the months we haven’t seen one another. My nephew, just past 2 1/2, projectile-vomited right before the dinner. Poor little guy. I was in the kitchen managing the last-minute shenanigans and I can’t say I’m sorry I missed it. But moments later, like a champ, he was sitting around the table like the rest of us, asking over and over if it was time for cake yet. That’s the spirit. The attendees: Dad and stepmom from Vermont; sister, sister-in-law, and nephew from Northampton, Mass., brother from Boston, sister from Durham, N.C. and her doggie. As soon as it was confirmed I’d be hosting I wanted to invite my NYC friends but nine was about the maximum that could fit around the table. The best part of the Thanksgiving organizing was menu planning. I culled recipes mainly from Bon Appétit, the Minimalist Baker (which has become one of my new favorite sources for recipes and inspiration), and the New York Times. I was accommodating a variety of diets, including: non-dairy; can’t eat garlic and onions; and vegetarian. As my boyfriend reminded me, it is often challenges that bring about the best creativity. Ugh, don’t you just hate when people saying annoyingly true things like that? *This is an unpublished recipe that will appear in the forthcoming book by Meike Peters of the popular blog Eat In My Kitchen, published by Prestel USA in Fall 2016. I ate it in Berlin in October and knew right then and there it had to be on my Thanksgiving table. **My stepmom’s classic recipe, the only thing I specifically asked that she bring with her from Vermont. She was so so kind enough to also bring, unsolicited, homemade apple sauce from her tree! Now, my notes. The outstanding dishes had to have been the soup and the raw slaw, though everything was very kindly applauded by my family, who honestly, I think were stunned at the quantity of food I produced. I did have a couple of great helpers in the kitchen — John and my sister Emily. And very sweetly, in the hour before dinner was served, my dad gamely mashed the potatoes and carved the turkey and my stepmom stepped in to make the gravy, which was so good, as always. After the last of the turkey was carved and the leftovers stuffed into every last tupperwear container we could possibly find, John and I slept for nine hours. For dinner tonight we made brown rice with tofu and steamed broccoli. Can you blame us? 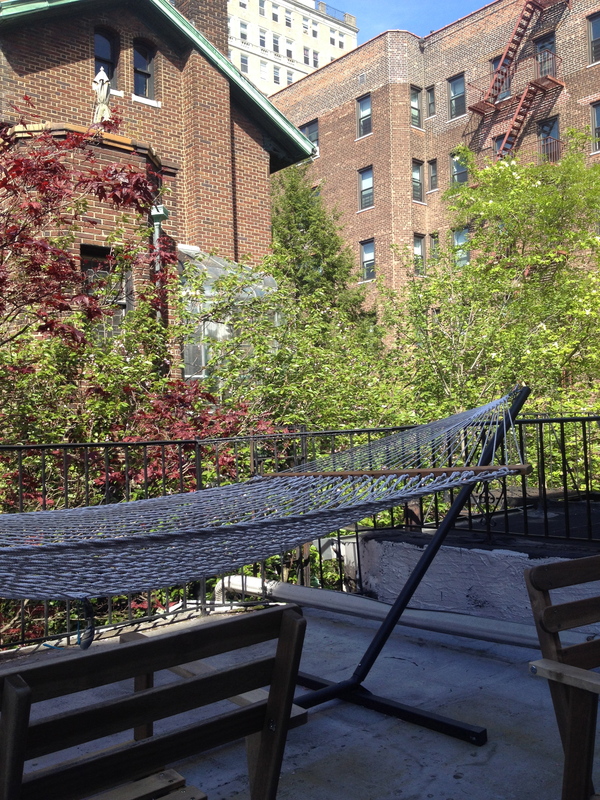 This was somewhat of a magical spring weekend in Brooklyn. 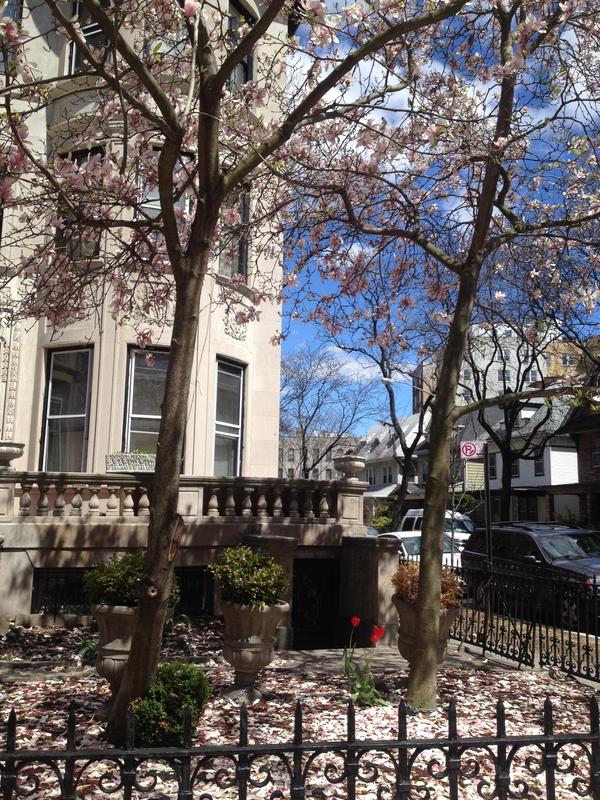 Finally, warmth. Finally, a reason to use sunscreen. Finally, dust off the bike and get in the park. I didn’t waste a minute of it. Saturday I was at the farmer’s market in Grand Army Plaza plucking asparagus and radishes (post to come soon). 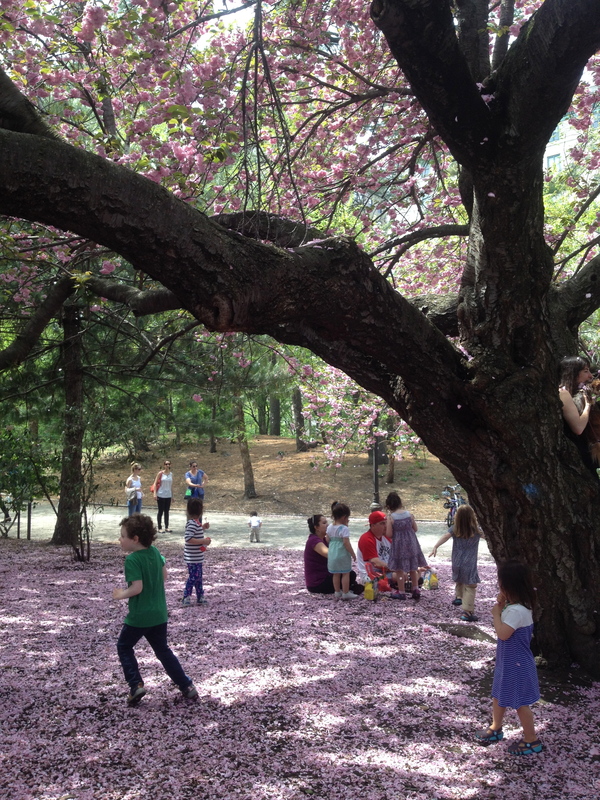 The cherry blossoms made a rosé carpet of petals. Today it was the Fifth Avenue market in Park Slope, stopping by to visit friends at the Butterstein’s kettle corn stand and Runner & Stone‘s tent for Peter Endriss’s almond croissants and rye miche. Other weekend treats included nettle gnochi (from Runner & Stone’s brick-and-mortar restaurant in Gowanus), tatsoi dressed with lemon and olive oil that I made at home, and these chocolate coconut date bars. Raw, vegan. 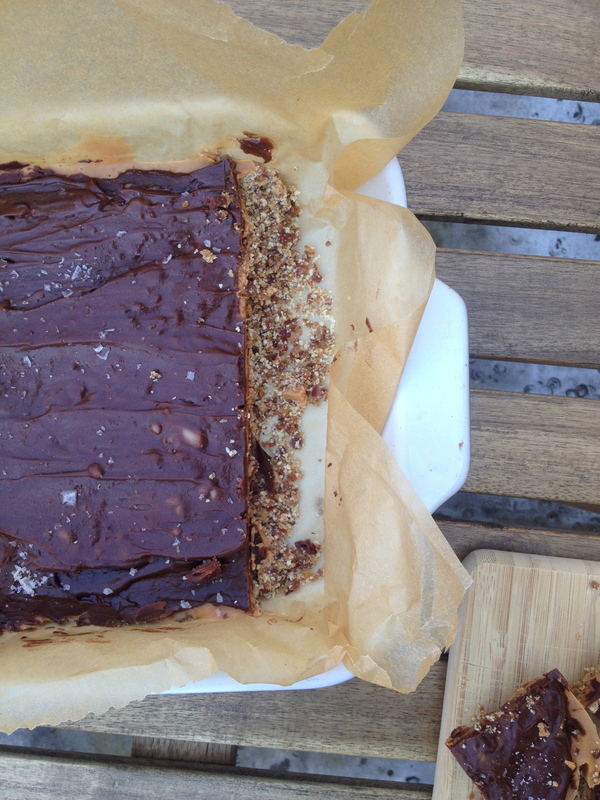 Inspired by fellow blogger Emily von Euw’s recipe for chocolate cream caramel bars over at This Rawsome Vegan Life. 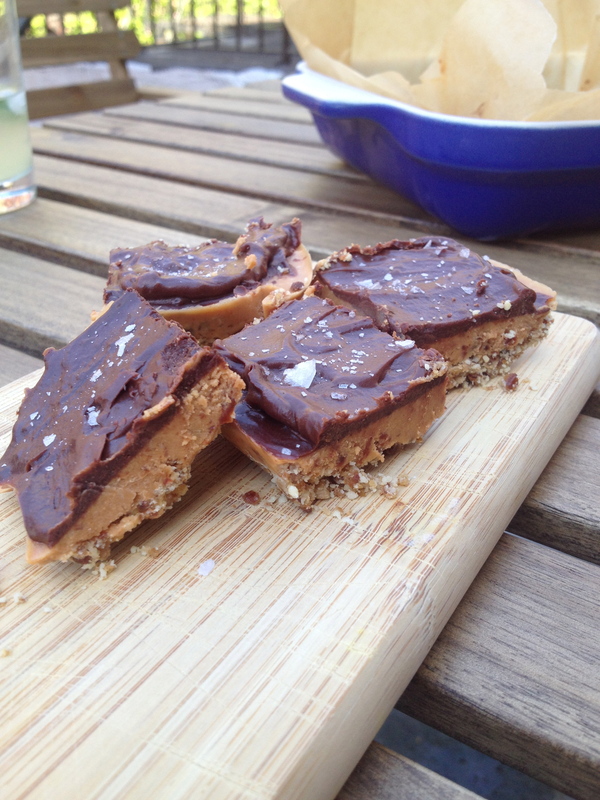 My friend Jill and I made some substitutions which ultimately worked well but left us with more of a peanut-butter-and-jelly style bar than a chocolate-cream-caramel. We substituted a cup of dates in the nut butter layer with a cup of dried cherries (because we ran out of dates, oops! ); and we used peanut butter instead of cashew butter mostly because it’s cheaper. Next time though I think I’ll try with the cashew butter and dates, but this version is lip-smacking. And there is no baking, no heat involved. All you need is a blender or food processor. And go see the new Jon Favreau movie Chef. It’s the story of a father learning how to get close to his son. It’s a story about how to make the best Cubanos. About how not to settle in life. Just don’t watch this movie hungry like I did. 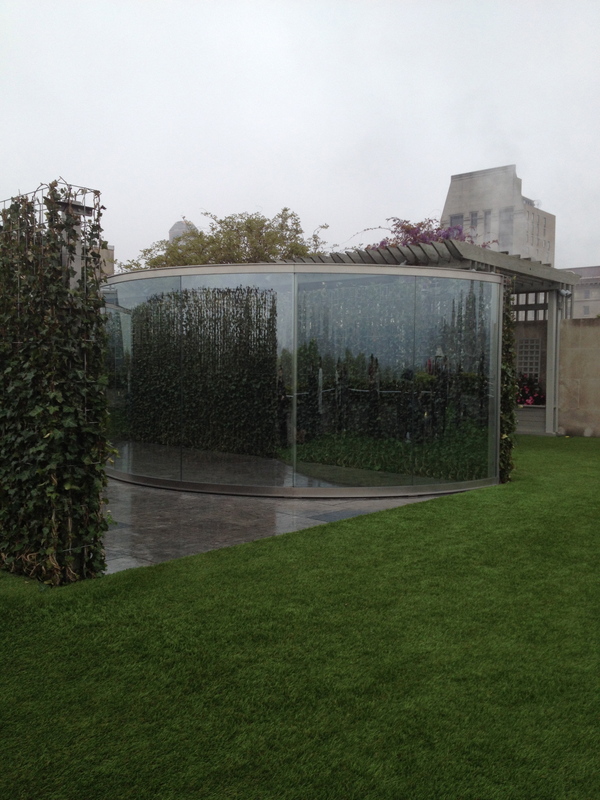 I also include a photo below of the new Dan Graham installation on the Met’s rooftop garden. If you’re in New York, go see it! 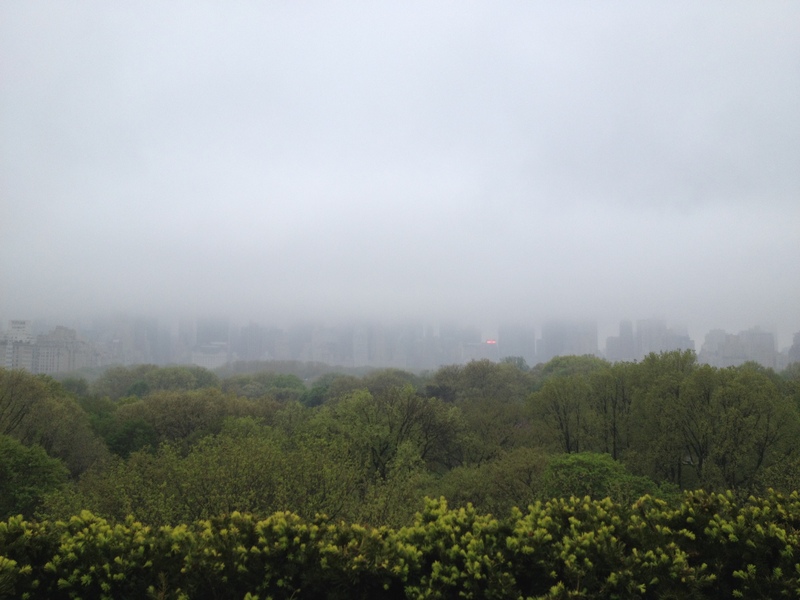 The views, even on a rainy misty evening, are sublime. Blend the almonds (or almond flour) with the dates in a food processor or blender until smooth and stuck together. 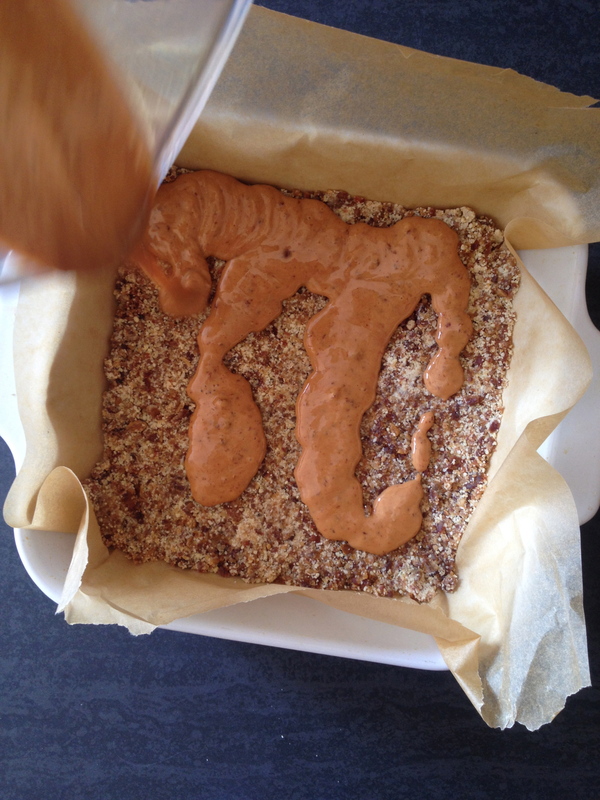 Press the mixture evenly into the bottom of a loaf pan or 8 x 8 baking pan lined with parchment paper. Refrigerate while you prepare the rest. Mix the nut butter, coconut oil, and dried cherries or dates in your food processor or blender until smooth. Pour over the slightly chilled crust layer. Refrigerate while you prepare the final layer. Wipe out your blender and add the remaining coconut oil, cocoa powder, and sweetener. Blend until smooth and pour this final layer on top. Chill in the refrigerator for a couple of hours. Or in the freezer for about 30 minutes. 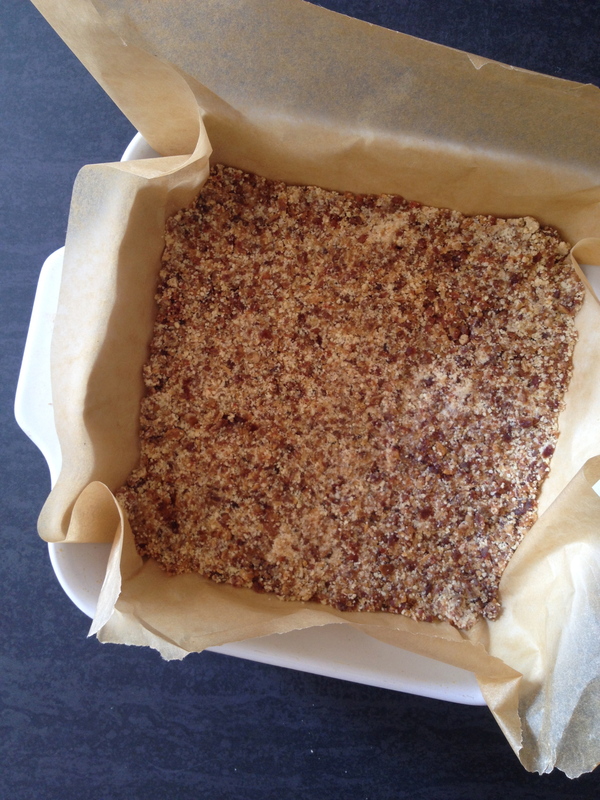 Before serving sprinkle some Maldon sea salt flakes over the top. I’ll also just say for all my vegans out there, take heart. 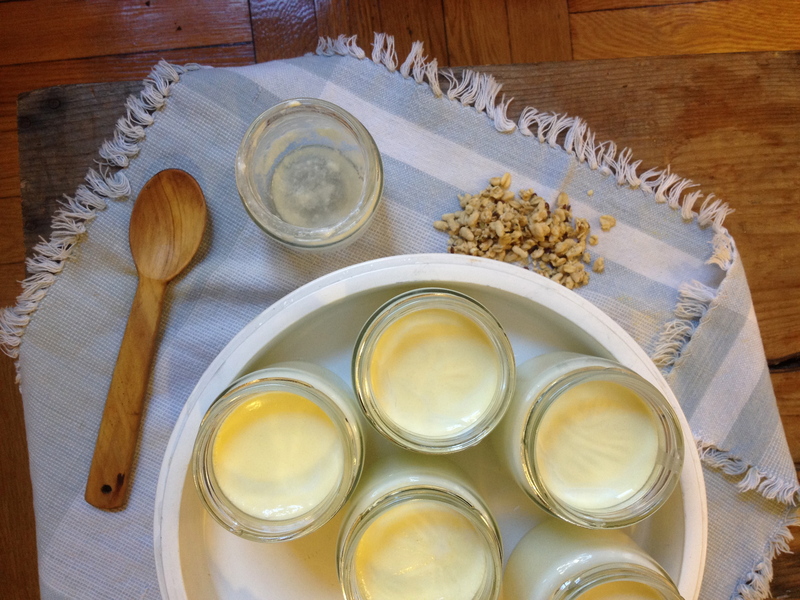 You can make non-dairy yogurt at home too. I’ve been making my own yogurt for a while now so I have my own culture to work from. I just save a little from each previous batch I make to mix with the new milk. You can also buy a single-serving container of yogurt and use that as a starter, or use a starter like Belle+Bella. I like theirs because it’s non-gmo and works well with soy, almond, or other kinds of milks. As with most things I make and document on this blog, I save neither time nor money by going the homemade route. Would it be easier to go into my local grocery store and buy a quart of Stonyfield yogurt? Yes. Cheaper? Probably. But would it taste as good? It’s also about avoiding processed food and additives when I can. I don’t do this religiously nor aspire to (until I become a yoga teacher who lives in Vermont and makes pottery in about twenty years.) Until then, I dabble in the fermenting arts when I can. You should give it a try. 1. Heat 1 quart or liter of milk to approximately 180 degrees F (82C). 2. Let the milk cool to approx. 108F (42C). 3. Stir either your packet of starter or your cup of yogurt with a small amount of the cooled milk and mix well. 4. Combine this mixture with the rest of the milk and stir well. 5. Keep warm at approx. 112F (44C) for at least five hours and up to about 12. You can do this in your oven but it really is a lot easier to use a yogurt maker. 6. Refrigerate for a few hours before eating.